Vial with one half troy ounce of fine gold from the Twin Creeks area of British Columbia, Canada. It was found by my brother. I only have one half ounce of this gold so get it while you can. This and the nuggets I currently have on the website are the last of the gold from the Twin Creeks area of B.C. My brother and his friends are no longer prospecting the area and there are currently no other prospectors working the area as it is considered "worked out" That makes the existing gold from this area rare. If you want some gold from this area this is your last chance to get it. 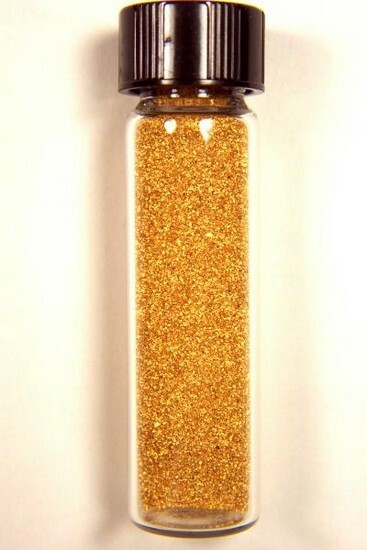 The weight of the gold in the vial is 15.9 Grams (0.51 Troy ounce). This is a great way to buy gold bullion. Also know as Flour Gold or Gold Dust, this fine gold is clean and bright. Gold this nice and clean is very rare and hard to find, so it sells at a premium over spot gold prices. Double or triple your money by putting it into small vials with water and selling it on eBay, flea markets, swap meets, or other venues. It makes a great investment and is ideal for jewelry making, gift giving and displaying. It is approximately 98% to 99% pure gold. (Approximately 23 KT).